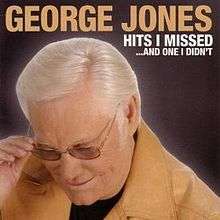 Hits I Missed...And One I Didn't is the 59th and final studio album by American country music singer George Jones, released in 2005. Originally conceived as "songs I wished I had recorded," Jones recorded eleven songs that included many he had passed on over the years that went on to become hits for other artists. The album includes his first ever "duet video" with Dolly Parton on the Hank Williams, Jr. penned "The Blues Man"; the song chronicles the life of a singer not unlike Jones himself. The one hit he did not miss, of course, is "He Stopped Loving Her Today", which went to number one for 18 weeks in 1980. Jones, who had no choice but to perform the song at virtually every show he had given since it came out, had resisted rerecording it for 25 years because he believed that the version he and producer Billy Sherrill created was too iconic. Jones would only trust Keith Stegall, whom he has often referred to as a "little Billy Sherrill", to touch his signature song. Although Jones's voice had started to show its age by this point, its timeworn quality brought a moral authenticity to the song. Stephen Thomas Erlewine of AllMusic writes of the LP: "The nicest thing about the album is that the arrangements are pure enough that it's easy to envision how these songs would have sounded if Jones had sung them first, but George's performances are those of a veteran who has paid his dues several times over, giving the album a comfortably worn, lived-in feel." Dolly Parton - duet vocals on "The Blues Man"